Those of you who’ve been following this blog for a while will know that a few years ago I joined Sutton Coldfield Speakers’ Club in order to gain the public speaking confidence necessary to promote myself and my books at author events. Last week I was part of a panel of three judges for a speech competition at a neighbouring club. The speeches were 6 to 8 minutes long and had a completely open theme. Thank You Gift for Judging Speech Competition! Project your voice from the very first word you utter. Grab the audience’s attention! Don’t continually sway from side to side or move your weight from one foot to another. It’s disconcerting to watch a human pendulum! Inject a little humour. Not in the form of a joke but perhaps a throwaway observation on something the audience is familiar with. Make eye contact with all parts of the audience – this means shifting your eye gaze around the room as you speak. Speak with minimal reference to notes – this will free you up to make appropriate gestures and make lots of eye contact with your audience. Don’t read your talk! From my own experience, I would add – don’t be put off if someone in the audience falls asleep. This has happened to me twice when speaking to groups of older ladies. The first time I put it down to the fact that we’d all just enjoyed a nice, big lunch. The second time, the organiser warned me in advance that one particular lady always went to sleep when they had a speaker and sure enough, I saw her head nod and her eyes close quite soon after I’d started. However many times you do it, speaking in public is nerve-wracking – if you’d like to practise in front of a sympathetic audience, find a Speakers’ Club near you. A few weeks ago I told you I was on a shortlist of eight for the Kobo-Silverwood Books-Berfort Open Day Writing Competition. I heard this week that I didn’t reach the final three. Congratulations to those who did: Phoebe Powell-Moore, Edward James and Sarah Channing Wright. Curiosity will definitely make me buy the winning novel when it’s published later this year. It’s not all bad news though. 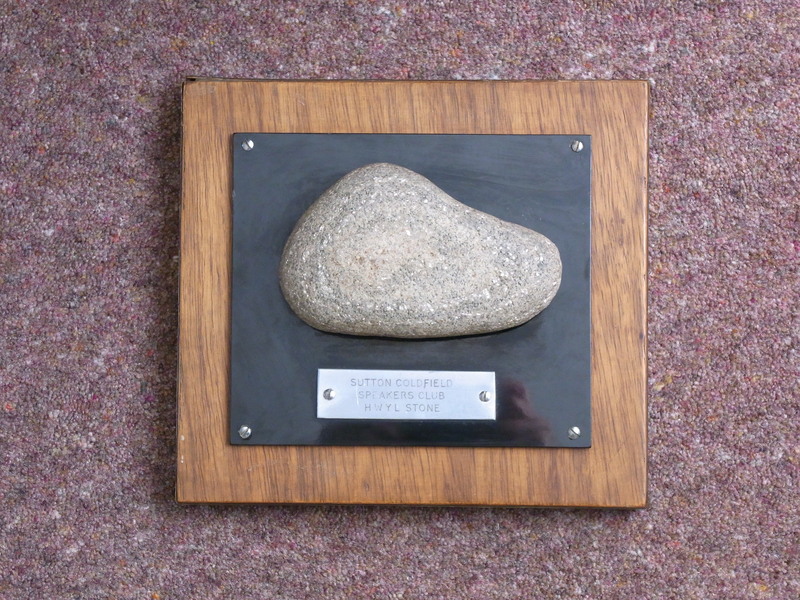 As some of you may have seen on Facebook, I was awarded the Hwyl Stone (pictured) for Most Improved Speaker by Sutton Coldfield Speakers’ Club . This was a nice confidence boost. The stone is supposed to have similar properties to the Blarney stone and was collected in Wales and made into a trophy by a former member. A useful blog post looking at Goal, Motivation and Conflict – the three essential things for every character. Without these it’s difficult to move the story forward. There’s also a good post on why you should enter competitions. Take a look at it if you’ve been dragging your feet lately and not submitting anything. Kobo are now running a Romantic Novel competition. It’s free to enter and the winner gets a publishing contract with Mills and Boon. Closing date July 14th 2015. Kobo do seem to do more to help and motivate writers than Amazon KDP. Or have I just missed the Amazon stuff? ‘It’s the taking part that counts’ is a phrase often bandied about to make people feel better if they don’t win or get placed in a competition. Mostly it just washes over us and we’re still fed up that we didn’t get a prize. Perhaps we even think about throwing in the towel and not bothering to enter any more competitions. Last week I had an experience that made me truly agree that it’s not the winning, it’s the taking part that counts. My Speakers’ Club asked me to represent them in a Speech Evaluation Contest against two other clubs. This involves giving a four minute speech on the strengths and weaknesses of a ‘target’ speech which all three competitors have just watched. I was a bit reluctant since I’ve only been in the club eighteen months but decided to have a go anyway. My fear was that I wouldn’t be able to think of anything to say or I would dry up or I would speak in a muddled, incoherent way. On the night, I discovered that one of my competitors runs a public speaking coaching business and the other had been education director of his club for fifteen years. This gave plenty of opportunity for making a fool of myself! Needless to say I came third (i.e. last!) in the competition BUT I was surprised to feel good in the face of defeat. There were lots of positives from the evening: I’d spoken to a larger audience than usual, I’d taken part in a speaking competition for the first time, I lasted the full four minutes, I’d been a ‘team player’ by agreeing to take part and my fellow Club members told me I hadn’t disgraced myself or let down the Club. I came away on a high! So, what’s all this got to do with writing? It’s to urge you to enter writing competitions even if you think you don’t stand a chance of winning. You will learn and gain experience from each competition entry, it might be writing to a tight deadline, trying to write to a different word count than usual or experimenting with a new genre. Don’t worry about winning, concentrate on the challenge of producing the best work you can. Erewash Writers’ Group New Writers’ Competition – 3,000 word short story. There is a £40 first prize and a FREE basic critique. Closes 26th March 2015. Nuneaton Writers’ Circle Flash Fiction Competition – free entry. Prize is 1 year’s free membership of Nuneaton Writers’ Circle. Closes 27th March 2015. Alfie Dog Review Competition – download a story from Alfie Dog during March 2015 and write a short review. First prize £100. As most of you will be aware by now, I am very interested in e-publishing and have been building my own e-publishing empire(!) for the last twelve months. I’ve picked up a lot of knowledge along the way and have also had many people say to me that they wished they were ‘technical’ enough to do the same. A couple of months ago Helen Yendall asked if I would talk about e-books and e-publishing to the writing class that she tutors at Moreton-in-Marsh. Whilst sorting out what I might say, quaking in my boots and being glad that I made the effort to join Sutton Coldfield Speakers’ Club, I realised that I had enough material to write a short e-book for beginners who want to publish their first e-book via Amazon KDP. 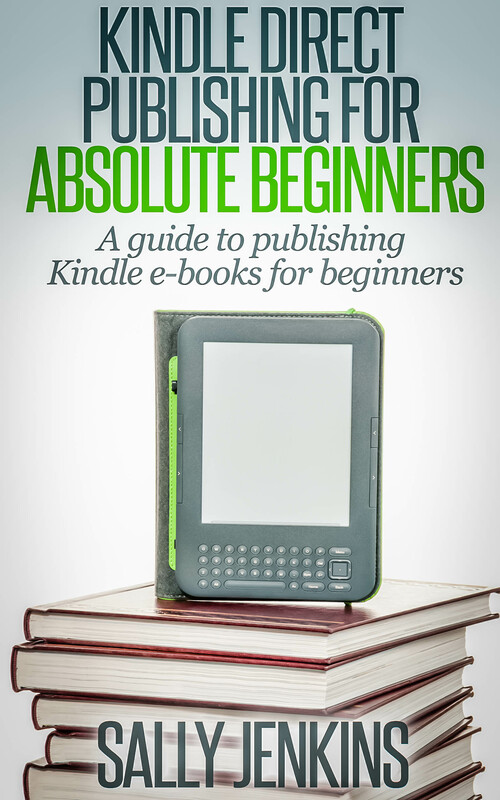 And so Kindle Direct Publishing for Absolute Beginners was born. It starts with the definition of an e-book and moves on through topics such as choosing what to write (if you don’t have a manuscript ‘ready to go’), how to get your book cover, basic marketing and much much more. 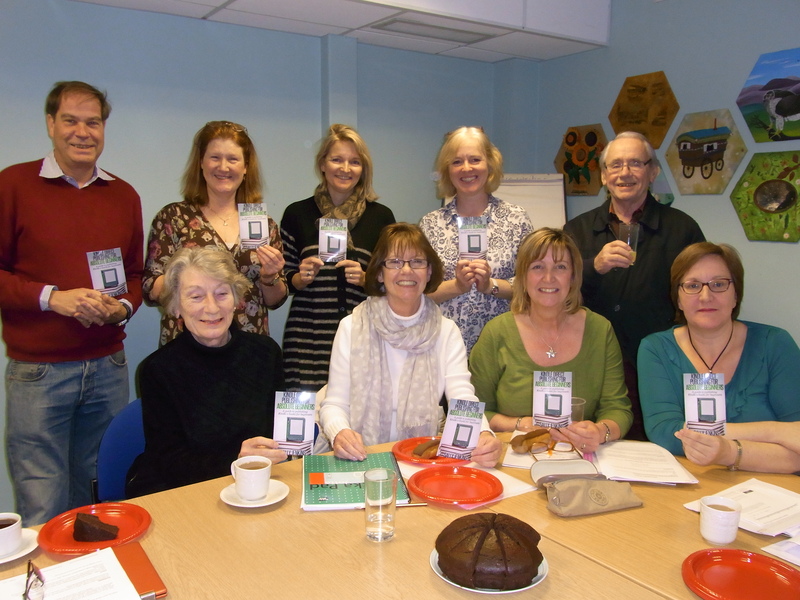 The launch of Kindle Direct Publishing for Absolute Beginners took place yesterday, following my talk to the lovely writers of Moreton-in-Marsh. There was Bucks Fizz, chocolate cake, coffee and one of the writers celebrated her new grandchild by providing cream cakes for the class – so no one went home hungry! It was really nice to be able to involve other people in the launch instead of doing everything virtually. So, if you’ve ever fancied seeing your work for sale on Amazon, go and take a look at Kindle Direct Publishing for Absolute Beginners – it might help you on your way! Last week I made two ‘performances’. Firstly, I made my first prepared speech at Sutton Coldfield Speakers’ Club and then, as a shortlisted contender in the Winnie the Pooh Laureate Competition, I read my children’s short story out loud on the telephone for final judging. Speakers’ Club. Prepared speeches are usually between six and eight minutes long and the subject matter should suit the theme of the evening – the exception being first speeches when the advice is to talk about something you know well. So I veered off the evening’s topic of ‘Love & Romance’ and talked about my hobby of church bell-ringing instead (exciting stuff I hear you say!). I spoke for 7 minutes 40 seconds (everything is timed with a stopwatch) and the speech was then evaluated by another club member. This is a bit like giving feedback at a writers’ group when work is read aloud. My evaluator was very kind and full of praise but also had some useful advice – I’d positioned myself to one side of the lectern and that meant that half the audience couldn’t see me properly and also the majority of my eye contact was down one side of the room. So some good advice to take away. My next speech is in around six weeks and the evening has the theme of ‘Springtime’. At the moment I haven’t a clue what to talk about – all that comes to mind is cute lambs, chicks and rabbits. Anyone got any ideas? Winnie the Pooh. I dialled into the conference call at the appointed time, only to find a lovely Scottish lady in full flow. I sat very quietly whilst she finished a wonderful story about Pooh visiting a park in Glasgow, complete with different voices for all the characters. Then it was my turn to read my story, ‘Winnie the Pooh and the Birmingham Iron Man’ – needless to say I didn’t do any special voices. The judges made some polite comments and said they’d let me know. 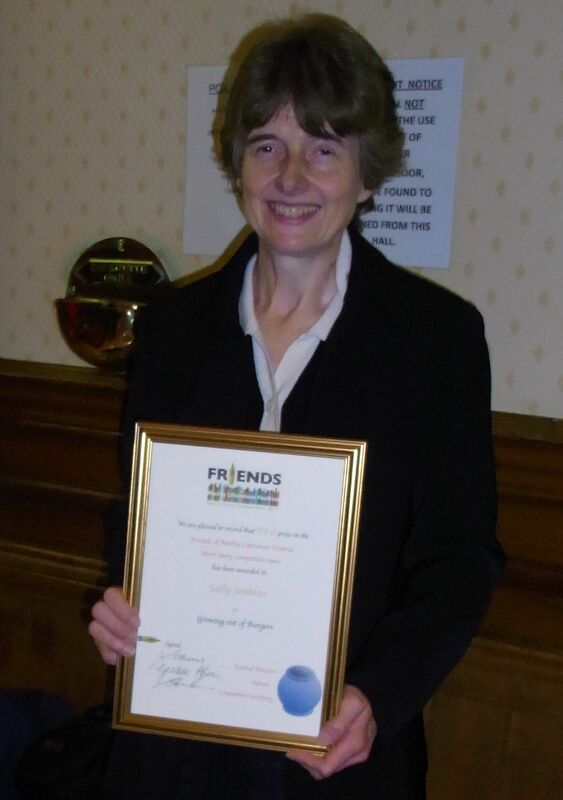 I mentioned a few weeks back that I won first prize in the Friends’ of Morley Literature Festival Short Story Competition 2013. Last Sunday was the prize giving and I travelled up to Morley in West Yorkshire to receive my certificate and a cheque for £50. The certificate came nicely framed and it’s gone straight on my mantelpiece. Gervase Phinn is the patron of the festival and he rounded off this year’s festival with an entertaining talk before making the presentation. As well as telling us about his experiences as a country school inspector (think James Herriot in a school inspector’s clothing) he was full of funny examples of mistakes we make with the English language, from his new book Mangled English – A Humorous Anthology of the Misuses of the English Language. I wish I’d written them all down now but if the book is half as enjoyable as the talk it will be a good read – and might make a good Christmas present for someone interested in words. If you’d like to enter the Morley 2014 short story competition contact the organiser, Stuart Pereira, by emailing fmlitfest@yahoo.com for full details and an entry form. Entry is free and it’s an open theme – so what have you got to lose? Gervase Phinn is an accomplished public speaker who knows how to hold an audience and keep them interested. I think it’s a skill that today’s writers need to master – whether it’s for promoting their work or teaching and running workshops. It’s also something that I’m useless at – so I’ve joined my local Speakers’ Club, whose strapline is ‘Speaking with Greater Confidence’. If you’d like to find out how my first meeting went have a look at my guest post on the Sutton Coldfield Speakers’ Club Blog. Many thanks to those of you who’ve taken the time to review Karen’s Story – The Museum of Fractured Lives. I do appreciate your honesty and I’ve learned a lot from the comments. There’s still time to enter the draw to win a Book Journal by leaving an Amazon review. Full details are here. Finally, if you’d like some tips on plotting your novel, Nick Daw’s Three Great Techniques for Plotting Your Novel or Screenplay is going to be free on Amazon over the next few days. If you want some ‘straight to the point’ advice it’s worth a read (and, as with any free book, please consider leaving a review if you enjoy it).